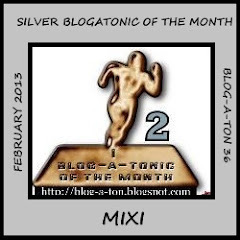 This post has been published by me as a part of the Blog-a-Ton 37; the thirty-seventh edition of the online marathon of Bloggers; where we decide and we write. 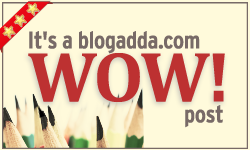 To be part of the next edition, visit and start following Blog-a-Ton. The theme for the month is "Truth is stranger than fiction"
Images from Google. Copyrights belong to respective owners. Lisa was an unassuming lady. Petite, plain-looking. And yet, she had a light in her eyes that distinguished her immediately from everyone else. A radiance that transformed her from an ordinary woman to an extraordinary one. She pressed a button and a picture of Harry appeared on the giant screen. She closed her eyes for a moment and breathed a silent prayer. She thought she would be nervous, but now faced with the task before her, she found that she was fearless. When she began speaking, every single person in the audience of over a thousand was spellbound. For truth is often stranger than fiction. My son Harry turns eleven today. Exactly a year ago, on his tenth birthday, he handed me a wish-list. Like every other boy his age, his wishes were fantastic and filled with the confidence and wonder that only children have. We adults don't dare to dream beyond our limitations. But Harry didn't know that. In his mind, there was nothing he couldn't do, if only he could find a way to do it. Harry has always held my heart in his hand. My only child, my only love. But we didn't spend enough time together back then. Between my two jobs and his unbelievably full schedule, we kept missing each other. So when Harry gave me his list, something clicked into place within me. Life had to be lived now, not twenty years later, not when we finally decided to make time to live. Harry and I made a pact that day - the following year would be spend making the things on his list come true. I didn't know how we would do it, but we had to try. The first thing I did was call Karen, my best friend. I have no family to speak of, and very few friends. I needed Karen to be my rock. The biggest problem was financing the entire affair. We were living day-to-day, with very little cash to spare. That was when Karen offered to build a website for Harry. Suddenly, we had a country full of friends. In the very first week, we got several thousand hits. The local radio station put in a word for us for free. Donations started pouring in from all across the country. The amounts varied from $10 to $100, but we were sitting on a cash-pile. When we posted on the website that we would prefer that donations be made to other charities, we started receiving offers from folks all over the country, offering to share their homes and their families with us, proposing new wishes that they could fulfill. Harry decided to pass them along to the Make-a-wish Foundation. Very soon, Harry had made life easier for hundreds of children. Word of his quest spread fast across the country. By the end of the first month, we had a solid lead on not one, but two wishes. On a nippy September evening, I received a call from Lans Van der Meer. The thick Rhodesian accent established him firmly as a South African. Lans had an offer for us. "What if I bring you and Harry over to Africa for a couple of weeks? I am currently on tour in the US and I will be leaving for Cape Town at the end of the month. October is a good month for shark-diving, and I happen to have ties with an outfit that does just that. They also organize game safaris, so if we're very, very lucky, Harry might just outrun a cheetah too! I will cash in on my frequent flyer miles for the tickets. What do you say?" I couldn't believe my ears. It was as though the universe was handing us this opportunity on a sliver platter. Suddenly, my conscience and my common sense were chiming in. What had seemed like a "Let's just wing it!" mission was acquiring practical and moral colours. "Mr. Van der Meer, I don't know how to respond to your offer. I simply could not impose on your kindness this way, unless there is some way we can pay you back." "Ms. Lisa, I am a pastor. I work with troubled young men and help them find direction in their lives. Your son Harry. is extraordinary. The clarity of his vision, his belief in his dreams and his wonderful act of charity in giving away his donations to the needy combine to make him a prime example of how one can achieve the impossible and be a good human being at the same time. What I need from you is to address a meeting at the youth centre during your visit." Harry was so excited. I thought over it. And decided to go for it. At the end of the month, we were in South Africa. It was the most fulfilling experience of my life. Pastor Van der Meer was six-and-a-half-feet tall, burly, red-faced, jovial man, unlike any pastor I had ever seen. He had a great sense of humour and kept us in splits with all his stories. His dedication to his cause, and the love he had for the young men in his care shone through his words and gestures. Twelve young men, formerly gangbangers, kept us company in Cape Town. 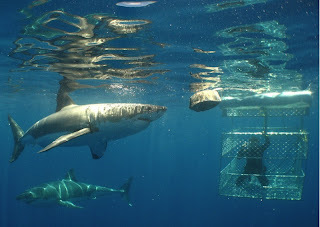 We swam with Great Whites. We really did. 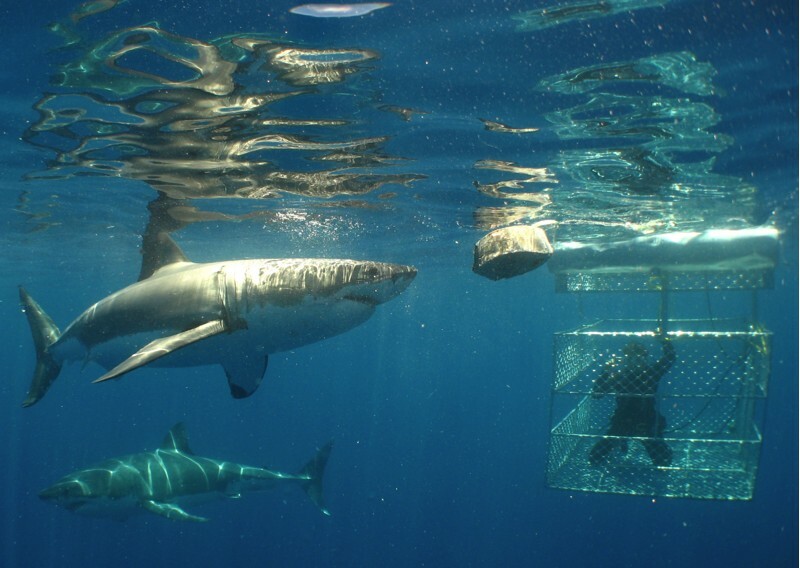 Harry and I sat in a cage, a few inches below the surface of the water. Two sharks swam close enough for us to touch. So did a couple of seals and a few dolphins a bit later on, after the sharks had swum away. Even though Harry did not want to swim with "dolfins", it appeared that they wanted to swim with Harry. A few days later, we were in a jeep hurtling across the dusty grasslands of a national park. We raced wildebeest and gazelles. We paused for a herd of elephants to cross the road. We even saw a pride of lions, complete with cubs. 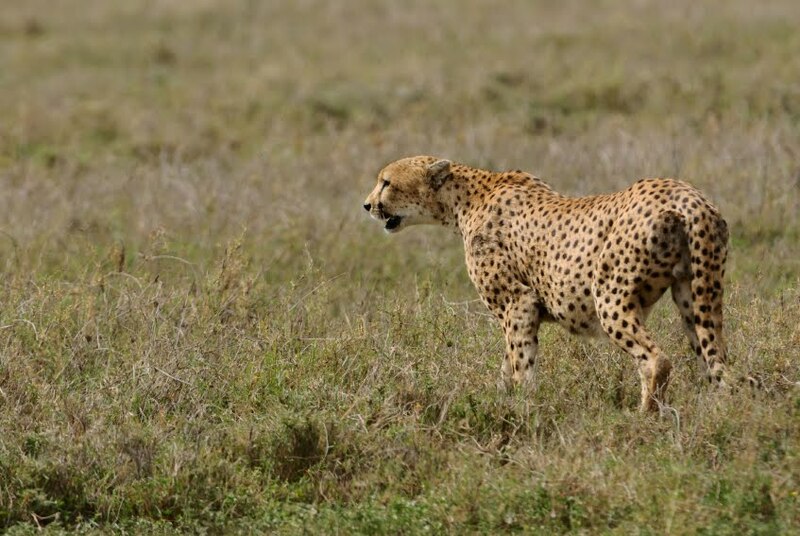 But the cheetahs remained elusive. Until we were just about to give up and turn back. The cheetah simply sauntered on to our path. It stood there looking at us with careless nonchalance. We were irritants, nothing more. Like the flies that deserved nothing more than to be swatted away with a flick of its tail. While we all held out breaths, it sauntered on, and disappeared into the tall, golden grass. Cheetahs are by far the most graceful and majestic among God's creations. Their muscles ripple under flawlessly shiny coats, their long, thin limbs move like poetry and their beautiful, almond shaped eyes hold the light of a thousand stars. I cried shamelessly at the beauty of this beast. Harry was unusually silent on the way back. All he said was , "Wow!" We didn't race against the cheetah. But as Harry pointed out to the youth group he spoke to, "If I'd jumped out and run, I'd have gone faster than the cheetah did crossing the road. So technically, I could have won.. if I had raced him." Thus satisfied, we returned to the US. Two down, three to go. Harry and I had already discussed the feasibility of this one. We both knew and accepted that it was impossible for Harry to physically climb Mt. Everest right then. We decided, instead, to send our representative instead. A tiny model of Harry, made by the main man himself, would take his place on the climb. It was February when I received a reply to an e-mail I'd sent to a group of mountaineering enthusiasts. An Everest expedition was being planned in May. If I could send mini-Harry to them by the end of the month, they would take it up with them. The group, called NeverRest, had failed to reach the summit two times before, but this time they declared they had the motivation they needed to succeed - they wanted Harry to climb the biggest mountain in the world. FedEx offered to fly mini-Harry by special courier to Nepal, where the NeverRest had already established base, in preparation for their climb three months away. A few days later, we were greeted on Skype by twenty-odd highly athletic looking young men and women. The NeverRest accepted mini-Harry in a solemn ceremony. The distance between our home and the misty mountains of Nepal was reduced to the thickness of a computer screen. All we could do now was wait for May and pray for the Summit. Harry's website was constantly updated with photographs, travel plans and personal experiences. It continued to generate donations to a large number of charities. Make-My-Wish was flooded with opportunities to make dreams come true for the terminally-ill. Harry's fame spread far and wide. "Mom, I know I may not be allowed to jump from the airplane, so I want you to do it for me instead." Harry's words echoed in my ears. April sunshine bathed my garden in warm hues. Before me sat Erin Linkly, a twenty-three year old sky-diving enthusiast, a chirpy red-haired girl who looked as though she was bouncing even when she sat. There was an energy about her that seemed to infect everyone around her. Erin was going to attempt a record number of jumps. The site was an hour's drive away from where we lived. Since the event was already sponsored, she offered me a free ride-along with an instructor. On one of her attempts, I would jump with her. 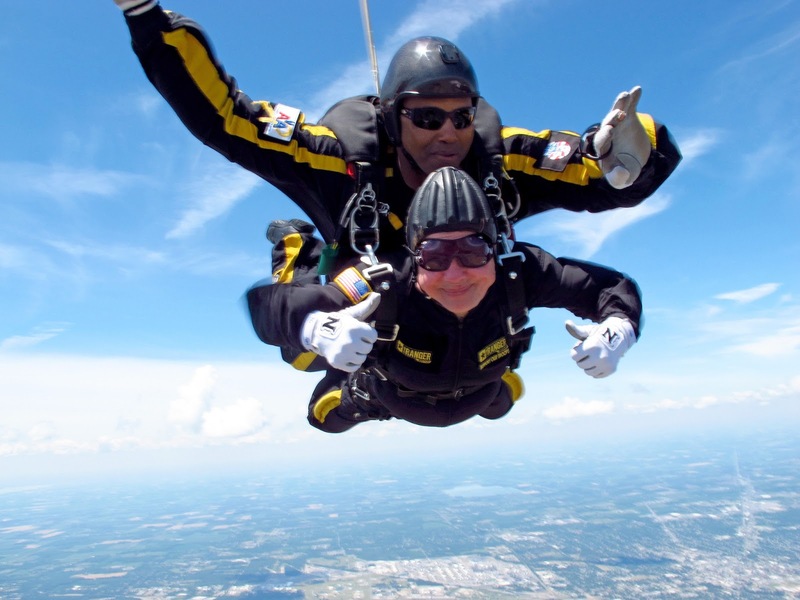 The way she spoke about it, I found myself increasingly enthusiastic about leaping from 15,000 feet. I almost forgot that once outside of Erin's sphere of influence, I would probably crawl into the shower crying and stay there. Looking down at the ground from the plane allowed me to think back over my life, my decision to throw Harry's abusive father out of my home, my failures, my achievements and above all, my life with Harry. His quest was irrevocably linked to my own success as a mother and a person. If I could do this for Harry, I would know for sure that I had made something of myself. I would walk with my head held high. The man before me put up three fingers. I was strapped to another man who was about to leap out into thin air. Erin crouched beside me, giving me a huge smile and a big thumbs-up. My throat was drier than it had ever been. I wanted to shake my head, scream, do anything to stop the counting. Unfortunately, it appeared I had lost all use of my faculties. Over two hundred people were rooting for me down on solid ground. Harry had an ever growing fan following! Three, Two, One. Go time. Before I knew it, I was floating in the sky. I think I screamed, I don't know for sure. All I know is I felt a rush like nothing before in my life. I was one with the universe. And I was finally at peace. With God, with myself, with life. 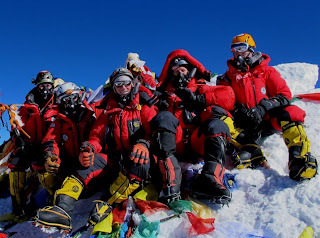 A month later, on 20th May, we spoke again on Skype to the brave mountaineers from NeverRest. The atmosphere of jubilation and success was palpable. Excitement and fervour pervaded the air. I could almost see fireworks in the room. The team had successfully reached the summit this time. Mini-Harry had elected to stay on top of Mt. Everest, a testimony to a ten-year-old boy's dreams fulfilled. When the leather-bound photograph of the group and mini-Harry sitting proudly on the summit reached us a few weeks later, we wept for joy. I don't think I have ever cried more in my life than I did in those months since we started the quest. The list was made on 28th July last year. I stand here before you today, exactly a year later. Harry is not here. In a moment, you'll see where he is. It is unbelievable that one little boy's wishlist changed so many lives. Harry's website has raised funds worth over $10 Million for charities all over the world. We've helped fulfill the wishes of over a thousand children. And today we have all of you here, sharing your hopes and your lives with us. Harry will turn eleven in thirty minutes from now. And we will all witness something even more incredible than the journey I have had this past year. We will watch Harry's last wish come true. The screen flickered and cleared, revealing a view from inside a spacecraft. Hello Earthlings! Greetings from the International Space Station. When we heard about Harry and how he's helped hundreds of kids with his generosity, we knew we had to help this guy with his own wish-list. In a few minutes, I will be walking in space with Harry. Ms. Lisa, we at the ISS are grateful and honored to be able to contribute to Harry's quest. The audience rose to their feet as one, applauding in joy as they watched the man on the screen don a helmet and step out into the universe. 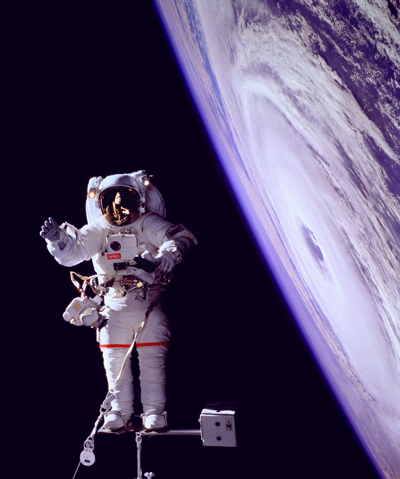 The astronaut slowly unscrewed a tin he held in his hand, and scattered dust into space. Lisa spoke, her voice catching in her throat. Harry died last December, after the trip to Africa. 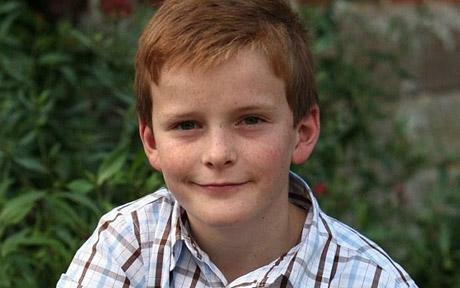 He had been diagnosed with end-stage leukemia a few months before his last birthday. The doctors did not give us much time. Harry knew it. I had always been honest with him, and he was wise beyond his age. 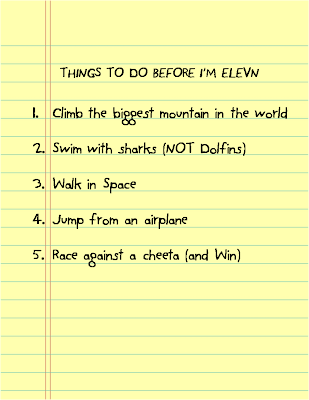 When he gave me his list, we talked in great detail about how to accomplish each of them. Where he couldn't do something physically, he found a work-around. "Mom, there's nothing to stop me from doing anything I want, if only I can find a way to do it." And he found a way to do in life and in death, what most of us would never even dream of. He swam with sharks when he couldn't even walk. He would have won a race against a cheetah if he could have raced. His hand-made model of himself stands on top of Mt. Everest. He jumped with me from an airplane. And today, his ashes are walking the universe. Along the way, he helped hundreds of children and their families gain a new lease on life. Even after I lost him, he gave me a way to find myself. Today, I stand before you a proud woman and the proud mother of an incredible human being. Thank you all for being part of his journey. Harry. The Boy Who Lived. Awesome...It’s wonderful to chase wild dreams...this shows us that dreams that seem impossible can be realized with determination and persistence, no matter what the odds are. you are an amazing story teller. this is such a wonderful inspiring story. Keep it up! Wow! Simply wow!! touching, moving actually I have no words. Thank you so much, Meenakshi! Touched deeply - at the same time - very inspiriring- we all can do so much in our day today lives- its just that we dont challenge ourselves - well. All the very best for BAT. you should send this to chicken soup ppl,its an inspiring story. Wow! Thanks Bushra. This is quite an honour! Speechless...i am speechless after reading it...!!! Anjan, thank you for your kind words! 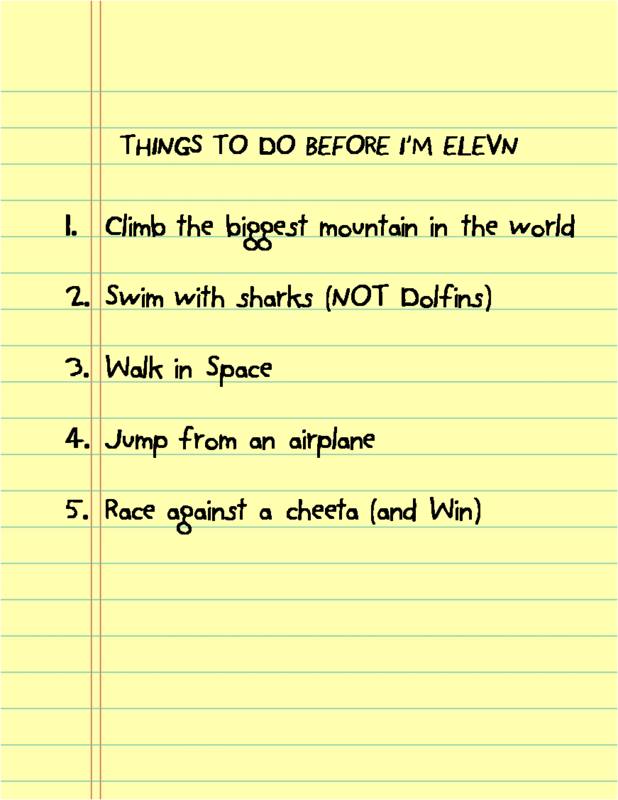 Thank you Viva :) And I guess we all would love to do at least one thing on the list, if not all! "Kehte hain agar kisi cheez ko agar dil se chaho to saari kayanath tumhe usse milane ki koshish me lag jaati hai.."
Very rightly said! Thank you for sharing your thoughts on this, Karan. Thank you so much Vajra. Yes, the first step is to dream, and dream big. Most often, that is the step we are reluctant to take. Such a beautiful, moving story. I agree you should send this story out to Chicken Soup for the Soul. Thanks so much for sharing it. I had thought I was way too old to dream until I started writing poetry again at age 58. Now I have a book published! Wow Susie! You're an inspiration yourself! And to tell you the truth, I could not have guessed your age form your photo, you look as young as ever ;) Thank you for sharing this about yourself Susie! you should keep chasing your passions..that's life ..Don't ever stop.I guess you have been inspired lately by "The secret wishlist"by Preeti shenoy.. Anyways you write awesome..Keep up the good work ..All the best for BAT.. Thanks Odyzz :) I hadn't heard of this book before this, but I must lay my hands on it ASAP! Out of words. Mesmerized toatally at the superb penning. Thank you so much Rio! don't know what to say Mixi. again i am finding it difficult to come up with a fitting comment for this post. even though i am not capable of writing such stories but i know how much effort is required to actually write a post like this. you should write a book someday if you haven't already. sorry for reading your posts in instalments. am bit lazy when it comes to reading. all the best for the contest! BTW, you should post more often. I keep waiting for your posts with bated breath, and I've been left breathless for a while! Fiction that reflects a lot of truth - we don't dare to dream enough. phew.. I was already in a sentimental mood today after ages and then I read your story... It is beautiful to the say the least.. and yes you have to tell me what inspired you to come up with this.. Thank you so much Karan :) I really don't know what inspired me to write this, but I'm so glad it touched you! I've not been here before, Mixi, or commented, or read any of the other posts on the last two Blog-a-tons. But I'm left wondering why you didn't get Gold. I should read Maliny's but this is a wonderful.. wonderful story. I read the latest 55 fictions too, and they're also brilliant. Wow. Leo - thank you for your kind words :) You simply MUST read Maliny's BAT entry posts (this time's and last time's) to know why she deserved to win both times! Absolutely lovely story. I really don't have any words to describe how I felt after reading this stunning piece. Why don't you come up with a novel? I think you will do better than the likes of Pretty Shenoy and Chetan Bhagat. It's very rare find an Indian author who knows her grammar as well as possesses a powerful skill to weave stories beautifully. I bet you can given other authors a run for their money! Thank you for sharing your thoughts with me! Feb 15 - Writing to me is.. 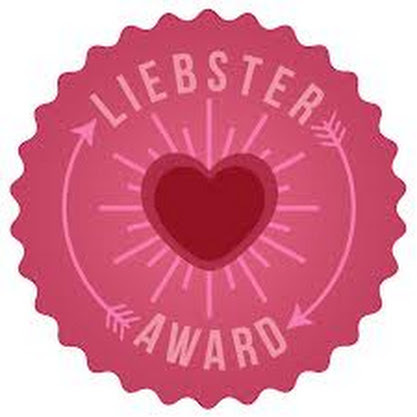 This is a Liebster Blog! All posts copyright to the author. Pictures posted herein copyright to their owners. Awesome Inc. theme. Theme images by lobaaaato. Powered by Blogger.